A little over 8 years back, my father in law and his wife sold us a no frills plain white Nissan Sentra. While I can't say I've ever been thrilled with the car itself, it has just kept running all these years. It also came at a price we couldn't refuse. I've used it to get to work while my wife and kids had access to our mini-van. It has been a wonderful help to our family. And it is not the first time he has helped us out with our cars. We've bought another car from him at well below cost, and he has helped us negotiate prices on the cars we've bought. Last week the Nissan started having some problems. At first it was semi stalling, but then it started smoking about the same time the engine started working well again. Kinda odd, but it was clear that it needed some help. It turns out that the air conditioner compressor is tied into the belt system of the engine, and the compressor had locked up. The smoke was from the belt being stripped and once that was done the engine was free to work as it always had. Still, it requires that we fix the A/C for the car to continue to work properly. My father in law had already talked about buying a new car and giving us his old one. He even had one on order. Great timing! We got our new car the weekend before we took the Nissan to the mechanic, so I still have something to drive to work while my wife has the van for kids and car pool. The new car does need some work done on it, and we'll get around to that soon enough. I don't think my father in law wanted to put any money into it, which is one of the reasons we got such a good deal on it. Our new car is a black Buick Regal GS with lots of fancy stuff on it, including a sun roof. It has a nice stereo system and lots of other buttons to push. The Nissan was definitely not worth naming, but I am starting to think about a name for our new Buick. Since it is all black, I was playing around with "USS Dark Matter". I also thought about "USS Dark Star", but that doesn't seem right either. I may need to give it a bit more time to jell. Here is a Picasa album of my son's better pictures. My son came home from his Kilimanjaro trip with Boy Scout Troop 1201. After almost a week, I still feel like we have scant few details. He did bring the camera home filled with over 700 photos and video clips. I'll upload a bunch of them to Picasa a little later this weekend. Here David is getting ready to head up the mountain. And here is his arrival at Gilman's Point at the top of Kilimanjaro. After our stroll at the beach, we headed out to the Cheesecake Factory for dinner. This is our second time there. I had Wasabi Crusted Ahi Tuna. The tuna was perfectly grilled to be uncooked in the center. Very well done. I also managed to get a few shrimp from my wife's plate of Shrimp Scampi. The best part was that we unexpectedly found out that it was National Cheesecake Day and our cheesecake was half price. We brought two pieces home since we were so full from dinner. My wife got a slice of 30th anniversary cheesecake that has 4 layers of yummy stuff including chocolate, which was her top priority. I brought home a pineapple upside down cheesecake. We started our day by skipping Starbuck's and heading to breakfast at Coco's instead. The waitress was a bit overworked, but managed to take care of use just fine. On the other hand, the host was less than pleasant. I had a nice breakfast called "Deviled Benedict" which was essentially egg salad over bacon on an English muffin. Smothered potatoes on the side. To be honest, I had though about Coconut Cream Pie for breakfast. We headed to Laguna Beach right after breakfast. Our first stop was the Sawdust Art Festival where we wandered around the booths and looked at lots of inspired arts and crafts. I think I liked the glass blower the best. I couldn't persuade my wife that she needed anything though. We took the free trolley to downtown and hopped another trolley to the beach. We ended up walking on the beach that I had visited many times in my youth. Lots of signs posted telling us that we couldn't do ANYTHING - kinda sad. We climbed over rocks and I dragged my wife out to the tide pools. I was very sad that I didn't see any anemones in the pools I looked at. I remember seeing all sorts of them when I was young. We really didn't go very far out though. I did see some nice little fish and crabs. We walked along the water's edge so that I could get my feet wet. We left the beach and headed up to the boardwalk (yes honey, they do have a boardwalk). We found a nice bench in the shade and sat and talked for a bit while our feet dried and the sand could be brushed off. After leaving the bench we wandered up past the Laguna Hotel which is where we spent the first night of our honeymoon. We were so busy that weekend that spending the night was pretty much all we did there. We also went past the place my sister got married and stopped at a nice lookout point. All in all, it was a very relaxing day. Unfortunately, both of our working camera's are off with the kids, so no photo shots to share. After dropping off our son at LAX, my wife and I started our small staycation at home without any kids for a few days. A four cheese fondue with vegetables and bread pieces to dip. A light salad with tomato slices and cheese, and a light vinaigrette dressing. A main course of meats including lobster, shrimp, beef, chicken and pork, along with assorted vegetables such as mushrooms, potatoes and broccoli. There were also some delicious cheese filled ravioli 'purses'. The fondue was a Cajun spice blend in a vegetable broth base. We were given specific instructions for cooking the meet and vegetables in the fondue. There were about 8 sauces included to dip things into, and they all had wonderful flavors. The final course was a chocolate fondue with caramel and nuts. Dipping items included cheesecake, brownies, marshmallows, rice crispy treats, strawberries and banana slices. I also had a great cup of coffee to wash that down. My wife was smart enough to stop eating when she was full, but I just polished off everything else that was left. I practically rolled out of there. We came home to a wonderfully empty house and spent some time tweeting and posting to Facebook before calling it a night. You are a protector and teacher. You help people deal with their struggles. Right now, you are seeking excitement and a bit of adventure in your life. You are drawn to people who are passionate and deep. You feel like there are a few minor things in your life that need to be changed. You find that any decision you have to make needs to be slept on... often for multiple nights. My son David left for Kilimanjaro yesterday afternoon. He's going with the Boy Scouts. I can't possibly keep up with all the details my wife has on her blog, so take a look there. The picture on top includes (from left to right) William, Alec and my David. They all started scouting in the same cub scout den in Pack 234. We moved to Fullerton and David joined the other two in 2nd grade. They are all great kids, and I am glad they have shared scouting for so long. And now the three of them will share an experience of a life time, climbing Kilimanjaro together. They are the youngest three on this outing, with my son being the very youngest. My wife fretted over the packing but she easily got the duffel bag under 50 pounds as required by the airline. We did have one minor incident just before leaving - the zipper of the duffel came apart on the other side of the latch. I had to force the latch back and re-zip it. We tried securing it with some bungees, but the airline made us take them off. I am really hoping that it stays together during the flight. We don't want him to loose important gear before he even gets there. No matter, I am sure he will make do with whatever he has left. We seem to be very busy at the moment with kids coming and going. My Daughter, Rebecca, went to Youth Wave for the week of July 13. She flew up to Portland Oregon for a church retreat that was hosted at Cascade College this year. 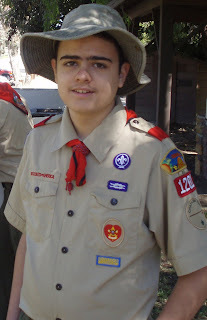 Last week my youngest son, Andrew, went to Camp Cherry Valley for Boy Scout summer camp. This coming week my daughter will leave for Teen Camp, another week long camp for her. And this Wednesday my son David will be leaving for a climb up Kilimanjaro in Tanzania Africa. When we moved into our house a little over 8 years ago, we set up an area for my computers. I spent some time researching and bought a fancy armoire to house my computers and allow me to work on computers for friends and family. The armoire was designed for a computer, though I have had a many as 6 stowed away inside. The doors close so you don't have to see the computer stuff, but more often than not the doors just remain open. I also bough t a nice computer chair, since I knew I would be spending a lot of time in it. In fact, when my wife and I are home, it seems like we play musical chairs at the computer desk, with one of us sitting down whenever the other gets up. Today, my chair broke. It had been listing over to the side for several weeks, so it was only a matter of time before it gave way. I had actually looked at it today and thought I might be able to repair it and get a little more use out of it. Times are tough and money is tight. While I was sitting in the chair it suddenly toppled over. The weld that attached the chair part to the caster base just cracked and separated with just a small part remaining attached. The back of the chair was left horizontal to the floor. I had to crawl out and get up. Click on the pictures for a closer look. So, I ran out and bought a new slightly better chair, with that assumption that we would be using it quite a bit for the next 10 years. 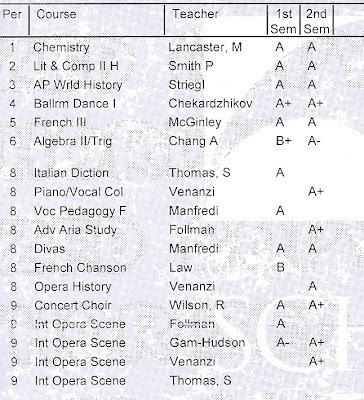 My daughter's report card! I am so proud of her. Next year she is planning a bunch of AP classes. I was doing some yard word yesterday and managed to corner a big fat lizard. He must have been eating lots of fat juicy bugs. I have just been talking to my son about local wild life in the neighborhood as part of his Boy Scout requirements. Since I had pulled up all of his cover and the source of all his good food, I relocated him to a hedge in the backyard. Hopefully nothing will find and eat him. Last year our Boy Scout Troop was informed that they would need to relocate while the First Presbyterian Church of Fullerton did some major construction work on their building. The date for the start of construction hadn't really been set, but was expected to be soon. The troop decided they should relocate before the end of summer. So in August 2008, the troop began meeting at the Sunny Hills Church of Christ, which is on the same street, just a few blocks down. The new location offered several nice features including more parking, a nice outdoor area and plenty of places for meeting and activities. Part of Coyote Hills is right behind the building with access from the street just a short walk away. Court of Honor was held in the auditorium with plenty of seating and a projection screen available. Parent Meetings were also held in the auditorium away from the kids. Patrol Leader Conference meetings for planning troop activities were also scheduled monthly outside of troop meetings. This last Monday was the last time the troop met at our temporary location. Construction at First Presbyterian is nearly complete and they are ready for the troop to return. I'll admit this was a little bitter sweet to me. I have been opening and closing the building weekly almost every Monday this last 11 months, ensuring everything was as it should be and locked up before I left. Arriving early and leaving late. It is nice being relieved of that duty. I am glad to have helped the troop find a temporary meeting location and particularly pleased that the Sunny Hills Church of Christ building would serve and facilitate the Boy Scout organization (not for the first time, either). A special thanks goes out to Donna Delgado for being particularly kind and helpful in arranging access and providing resources when needed and to Ellen Murphy for coordinating the calendar and ensuring we had a place to meet on a regular basis. All three of my children have gone through the PGMB program at my church. The program was designed and has been run by Steve and Terri Paden for as long as I can remember - at least 15 years and probably a lot longer. It involves memorization, competition and games between teams. The program is designed for 1st through 6th graders. Each year has a different book for a total of 6 books of material. A number of helpers assist in the program including Kathy McBride and Phyllis Goodwin. Some of the past participants have also served as helpers. My two oldest kids completed the program with 6 straight years of Gold Medals meaning they had perfect scores in memorization. The program includes many other prizes and awards along the way as well. My youngest son completed the program this year. He entered the program in kindergarten. He has been awarded the Gold Medal 7 years, which only a few other kids have done. Alec R. also completed 7 years of the program with Gold Medals. The picture above shows them being recognized for their accomplishment. My son also got up and read his favorite memory verse to the church this year to honor his father, and I was presented with a book mark in commemoration of his achievements. So this ends an era as my youngest moves out of elementary grades. I've been proud of all of their accomplishments. Thank you to the PGMB team who worked with all of my kids through the years. My family presented me with some wonderful gifts this morning. I received a card from each kid with appropriate and funny greetings in them. One of the cards talked about using duct tape to repair things. One of the gifts I received had make-shift wrapping on it. The stuff they bought didn't work out. The gift was wrapped in Ariel paper with something other than scotch tape. The card and gift went so well with each other, I got a great kick out of it. I received two new pairs of shorts, and the Monte Python and the Holy Grail movie that I can watch with the kids. Great fun. Finally, my dear daughter made me a batch of biscotti. To be honest, my wife makes her father a batch of biscotti, and I am slightly jealous that she doesn't give me any. So I see my wife is teaching the tradition to her daughter. I am a very proud father and love my children. I got this idea from one of the bloggers I follow. A review site for the blogs that I like and follow. I don't know how often I will add entries, but will try to add a new one now and then. Take a peek and let me know if you would like me to say something about your blog there. My boys and I went backpacking with our Boy Scout Troop 1201 this weekend. We went to Columbine Springs camp. The trail head is in Angelus Oaks, just below Big Bear. We had a grueling ascent of about 2300 ft. On the way up we had an incredible view as we climbed about the clouds. The peaks across the valley showed like islands in the clouds. Very picturesque! At the top of our climb we traversed a saddle between peaks. The relatively flat bridge was covered in manzanita. There was lots of other shrubbery, but the manzanita has smooth bright red bark, making it very unique. I understand that it is protected. The saddle looked like a meadow. We then made a sharp descent of about 500 feet to our camp area. We had seen plenty of day hikers, but this trail was not used very often and we were completely isolated down in our camping area. Other than a few planes it was very quiet. The temperature dropped to quickly and went down to 39 degrees over night. We all turned in early to get out of the cold. It is probably just as well, since the boys made up a game involving tying each other up, which the adults nixed in the end. The next morning we ate breakfast, packed up and made our ascent up 500 feet back to the saddle. Thank goodness the rest was all down hill from there! Every trip we hand out a camp gadget; something small but very useful on backpacks. This trip we handed out bandanna's with the US flag on them, in honor of Flag Day. Our Scout Master even brought a flag to post in camp - a first for me on a backpack trip! Last Saturday I helped a prayer warrior move her daily inspirational thoughts out of e-mail and into a blog. Freda has been serving in her ministry since March 2000, and now she moves her Thought for Today into the blogosphere. Please visit her and say hello. My daughter turned 16 on Wednesday - at 11:00 PM mind you, so our celebration was a tad bit premature. My wife always does such a great job of making people feel special, which she did for my daughter this year. We gave my daughter 16 presents and had her grandparents over for a small family celebration, including chocolate cake, ice cream, and sliced strawberries served with whipped cream. I was recently summoned to serve jury duty for the Federal Court in Santa Ana. I usually feel a sense of duty to serve, though I was not overly thrilled with this case. I had been summoned to serve in our local Superior Court in the last year, but that service would not get you excused from this summons unless you had actually served as a juror in a trial. While I have been summoned numerous times over the years, I have not actually served on a trial for at least 15 years, and probably more than that. I'd actually enjoy sitting on a case if it was expected to last several weeks. The summons indicated that the case could last 4 to 6 months. Since my employer gives me full wages while I serve, I expect I am rather appealing to the court. I have a lot of projects at work right now, and knew that taking that time away would significantly stall and probably kill several of them. The first day in court involved a number of administrative type tasks. They checked me in. The judge then spent some time talking about duty, how the selection process would be handled, that we should avoid news sources that might give information about the trial with possible biased oppinions and that we were NOT to talk to anyone about the details of the trial so as to avoid outside influence before reaching a verdict. The prosecuting attorneys then read the indictment to the jury assembly room. The indictment included well over 300 charges against approximately 8 defendants. While I didn't count them, there were probably somewhere around 500 charges. It took 3 hours to read. I think I only nodded off twice. We then completed a lengthy questionnaire of about 10 pages with many written answers. I was hoping that my answers on the questionnaire would get me dismissed without having to return to the court - they usually do, though I have nothing bad to report. But, there I was again, sitting in the assembly room. We were informed several times that the court needed various recesses during the day, and we were never called in to begin the actual juror selection process. I made a lot of headway on a book I had bought to occupy my time. Finally, at the end of the day we were informed that all of the defendants has submitted plea bargains. Once the judge had accepted all of them, he was then free to dismiss all the jurors in the assembly room. While I am now at liberty to discuss the details of the case, I expect it is probably best I not share them here. The judge was very congenial and thanked us each personally for coming in to serve. He indicated that over 9000 summons had been issued to come up with the jury pool of about 160 potential jurors. He also indicated that our presense directly impacted the defendants as the prospect of a trail became emminent. He assured us that our time had been well spent. I am glad that I had a chance to serve, but I am equally glad that I did not have to spend 6 months on the trial with the impact I expected with my work. 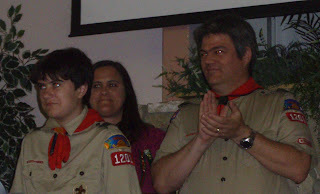 My son David was nominated for induction into the Order of the Arrow, a Boy Scout National Honor Society. He had to be elected into the order by his fellow Boy Scouts in his troop. He will have to complete some additional tasks, include his Ordeal, before he becomes an actual member. His Ordeal will involve staying in the wilderness alone overnight. Adults will be in the area to ensure his safety, but he will only see them if significant danger threatens. I am glad he was nominated, and I am very proud of him. I worked at Camporee over the weekend. I was part of the Citizenship station. I played the administrative role. Each scout patrol would come and present themselves to me. They would show me their flag and give their patrol yell. I would prepare their score card and give them their first points based on presenting their flag and reciting their yell. Only one patrol came to me without a flag, while two others got partial points because they did not present their flag to me. I would then direct the patrol to meet with ASM's who would judge the boys on their abilities to correctly handle a U.S. flag - unfolding, presenting and refolding. They also had to answer various questions regarding their rights and responsibilities as U.S. Citizens. Afterward, they would return to me to have their score for the event calculated and be presented with a ribbon for first, second or third place, based on their score. It was a long but productive day. It has been just over a year since I was a Webelos Den Leader in Cub Scouts. One of the things I enjoy about Camporee is a chance to see some of my cubs. I got to see Jimmy and Michael this year. Their picture is shown to the right. I noticed Jimmy immediately. To be honest, Michael had changed so much that I didn't recognize him right off. They told me that Ryan and Zachary were still in Boy Scouts, but had not come to Camporee this year. Camporee itself had some interesting aspects this year. We were on the bank of Irvine Lake. Across the lake was a punk band concert. I understand it was 23 bands playing from 10:00 AM to 10:00 PM. Unfortunately, some of their language was a bit colorful. For some odd reason our 15 year old daughter demanded an egg hunt this Easter. We hid three bags of chocolate eggs around our family room. The kids ransacked the room and found most of the eggs. We'll see what additional eggs are found in coming months. This was a simple and relaxing Easter for us. Church, our Easter egg hunt and a ham dinner. The same day we left for our Canoe Trip David received a letter from Orange County High School of the Arts. OCHSA is a public magnate school specializing in various artistic media. The school seems to have high academic standards, but is most known for the various artistic conservatories. Applicants must pass an exam to be accepted into a conservatory and attend the school. Our daughter has been attending for two years in the Opera Conservatory, where the school is the premier high school in the nation for opera. Our son David has been doing various creative writing for several years now and tested to attend the Creative Writing Conservatory. My wife was itching to open the letter all week while we were gone, but my son demanded that he be the one to open the letter. Before opening it, he said that he would attend the school if he was accepted. David opened the letter Saturday night after our return. He has been accepted into the Creative Writing Conservatory. Even better yet, one of his favorite homeschooled friends was also accepted, so he is going with a friend. I was invited to a District Dinner last night to receive an award. This is the second dinner and award I have received, but my first was from before I blogged. This dinner was at the all new Outdoor Education Center inside Irvine Park in Orange. The facilities were very nice. 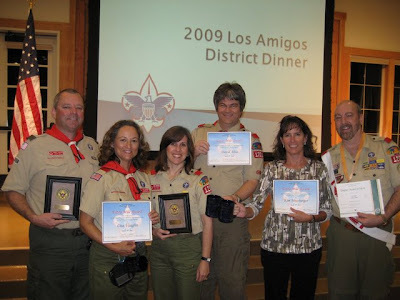 Here are the awardees from Troop 1201 in order: Scott Allan, Lisa Vaughn, Irene Rassmussen, David Ahia, Kim Messbarger and Steve Herbets. 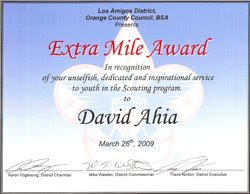 I received the Extra Mile Award. I am not sure who may have nominated me and for what service in particular, but I am grateful for the nomination and recognition. I think the Scouting Programs (both Boy and Girl Scouts) offer tremendous benefits to our youth and I am proud to support the organizations. Along with the award, I received a VERY nice coffee mug. On one side is the Boy Scout emblem and on the other side is the Scout Oath. The Scout Law is shown in bands around the top and bottom. Click on the pictures for a closer look. I was told before I got home tonight that I would be on my own for dinner, and have to find something to feed the boys too. I looked around at the available ingredients and spied the bag of potatoes in the closet. Fried potatoes seems to be a semi-regular stand-by for me since we usually have potatoes around and don't use them fast enough. On top of that the kids actually like my fried potatoes, at least most of the time. The problem is that I never make them the same way twice. Chopped onion, celery and/or garlic - whatever is available. oil for the bottom of the skillet. potatoes, pre-cooked in the microwave, and cubed to about 1 inch or so. seasoning - usually includes salt, paprika, pepper, crushed red pepper, (onion or garlic powder if you didn't include those above) and anything else that suits your fancy for the moment. Heat skillet with oil. Dump the chopped veggies in and lightly brown in the oil. Dump the potatoes in and stir to mix with the veggies. Keep turning potatoes over as you add the seasonings. The paprika gives a nice color and should be evenly distributed. Keep turning until the potatoes are completely cooked. A friend of ours provided a large container of Pappy's choice seasoning which contains all the seasonings that I've mentioned above and a few more. I use a lot, so the results are a tad salty. This is a good choice if you have it and want more consistent flavoring. This evening I threw the potatoes in a bowl, added a number of jalapenos from a jar, and dumped half a can of chili over top. Very tasty. As promised, here is a picture of my 'new to me' telescope. I put it back together today and had my daughter snap off a shot so that I could share with you. I am still missing a piece; seems that the knob to adjust the focus is missing, so it is not usable yet. But I hope to turn it to the sky soon! My son David has signed up for a trek to the top of Kilimanjaro in Tanzania, Africa. We had been putting it off, but we could put it off no longer. We had to buy gear for his trip up the mountain. Here in sunny California, winter gear is often only available during the winter months, and we were running out of time. So, Saturday was spent at the local REI getting the things he will need to climb the mountain. The bottom of the mountain is arid, but he will be climbing through tropical forest with daily rainfall until he reaches the top which is covered in an ice cap. He will need to be prepared to travel through all the environments. His gear includes a thick pair of thermal underwear designed to wick moisture away from his body so that he stays dry and warm. The next layer is a set of insulating jacket and pants. For additional warmth, he will have a vest that he can add over the jacket. Finally he has a set of rain gear - jacket and pants. For his head, he will have a balaclava and a beanie to put over it. He will have liner socks and three thickness of hiking socks, so he can move to thicker layers as he moves up. His gloves have a liner so that he can take them off and do tasks without completely exposing his hands. While trekking during the day, he will probably get warm and remove layers as he goes, but as they stop to camp each night, he will have to add a number of layers to stay warm. We are hoping he adds the layers before he actually starts to get cold. We have other gear he will be taking, and some of it we can purchase later. Not pictured is a zero degree sleeping bag. We have a lot of concerns about his trip and neither of us will be with him. We will be relying on the adult scout leaders to ensure his safely and comfort. I'm sure I'll be blogging more as his departure nears. See my wife's entry on the subject. It seems like my posts are getting fewer and farther between. I have been fairly busy, so there should be some good stuff to add here. Last night I was given the largest telescope I have ever seen for home use. The tube is about 6 feet long and 10 inches in diameter. The base weighs about 80 pounds. This is not something to be moved around on a lark. I understand that it is custom built. It has a drive motor to keep it synched with the stars in the sky. I have no idea how good it is. I'll plan to post some pics when I get it all re-assembled. This seems to be a week of Scout meetings. Monday night we had a troop meeting. Tuesday night we went to a meeting to learn how to earn the Eagle rank. Wednesday night was a Patrol Leaders Conference meeting with leadership training incorporated. We are supposed to go to Death Vally with the troop this weekend, but both of my boy's got sick this week, and I don't think they will be well enough by this weekend for us to be able to go. I feel like I've been on the run.